As our work days get longer, and daylight hours get shorter this time of year, the only time we might have to enjoy our gardens is after the sun goes down. Combine that with the desire to spend more precious free time outdoors and the concept of outdoor lighting is appealing; especially when you consider how easy it is to install a system yourself. Outdoor illumination today is not only appropriate for safety issues, it creates ambiance. Lighting can draw attention to a special tree or feature, lead you safely down a path or provide security. In all cases it can allow our gardens to be enjoyed after dark, not in the dark! Innovations in technology allow for even the most project challenged homeowners to quickly and easily install a complete system with the look of a professional job. • Ambience and Interest: Most of the time, our first thoughts when adding an outdoor lighting system is to create accent lighting or to add beauty to our evening landscape. There are a number of ways to create this with the lighting options available. • Pathway Lighting: The most common application is pathway lighting. Even the most basic kits are appropriate for this. Lights are either illuminated or projected from about ankle to knee height to light the walking path. It certainly has an aesthetic appeal but its basic function is to provide safety. • Security Lighting: Considering safety, security lighting is placed strategically to eliminate dark spots. Although this type of lighting can serve to accent special features, its primary purpose is to provide safety and security. • Area Lighting: This type of lighting is generally intended to cover a broad area, rather than spot or accent lighting which features a specific object. Again this type of lighting is primarily utilized for safety and security. • Spot Lighting: Unlike area lighting, spot lighting is intended to illuminate a specific feature such as an art object or special accent tree. There is no denying that when an object is spot lighted, you simply can’t help but notice it. 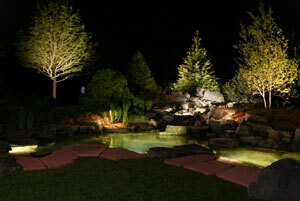 Mood lighting offers a number of different techniques to accent specific features in the landscape or around your home. These features, although helpful to illuminate the general area, are usually not intended for safety and security as their primary purpose. • Moon Lighting: This technique places lights high in the trees to wash over a large area giving the appearance of a full moon – all month long. • Shadow Lighting: This type of lighting is used to cast a shadow from a tree, sculpture or other garden feature onto the ground or wall of a structure to create a shadow effect. • Silhouette Lighting: In this case, lighting is placed behind an object to highlight and feature the bones or shape of the structure through backlighting. Silhouette lighting is ideal to feature the architectural detail of a structure. • Down Lighting: I love to see tall trees that have been installed with down lighting, especially in winter when the trees are void of leaves. Down lighting always creates a dramatic effect to accentuate the interesting branch structure. • If simply against a wall it can accent the texture while providing additional safety and security. One of the nicest effects of this type of lighting, often referred to as “wall wash lighting” is to soften the wall and or accent the texture of the surface. • Up Lighting: Another dramatic effect is created when lights are placed at the bottom of a structure or tree and aimed upward. This type of lighting always gets noticed and really commands attention and interest. Besides the aesthetic benefits, lighting a dark space is one of the most important deterrents to keeping potential burglars and vandals away, illuminating potentially dangerous areas for visiting family and friends and overall, making your property safe and secure for everyone.